So....ladies I present to you.....CLINIQUE! I just hope that no one will be mad at me. It is not that I hate this products but I think they didn't have a WOW effect, at least not for me. 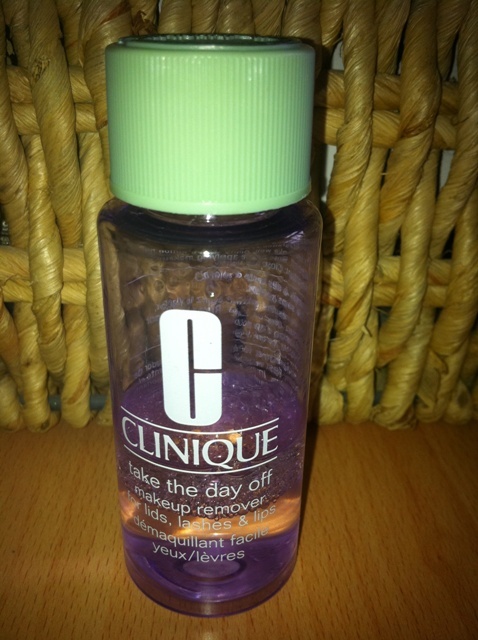 I am going to start with the Take the day off makeup remover. I've heard a lot of good things about this product so I wanted to try it but when I came to Limoni (a store similar to Sephora or Ulta) it was about 15 GBP, 20 Euros or 25 $ for 125 ml/4.2 oz of product. That seemed a bit much for my taste especially when I saw that it had oil in it and I usually don't like that. But, a friend gave a 3 step kit to me so I got to try it (these are good sample sizes- 30 ml/ 1fl.oz, enough to test them for a while, they lasted me for a month, only Take the day off didn't last as long). It is suitable for all skin types and it is great for removing makeup from lids, lashes and lips. The company claimes that it quickly lifts away long-wearing eye and lip makeup without tugging. It easily dissolves longwearing makeup, even waterproof mascara. This gentle formula is tug-free, non-irritating, and non-stinging. And I agree. 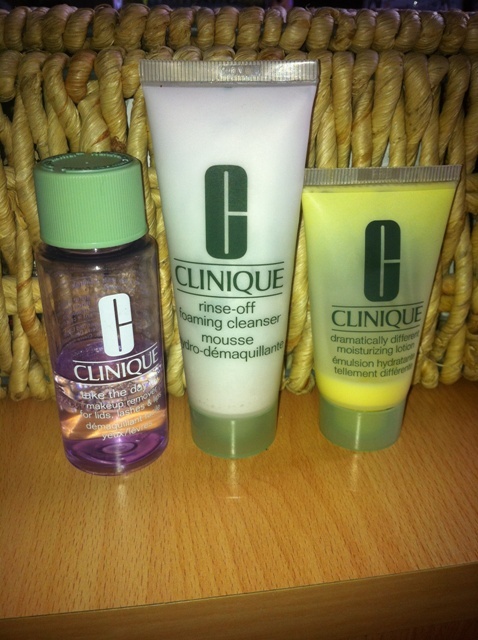 It removes makeup nicely, it doesn't irritate the eyes. I know that probably most of you already know how to remove makeup without tugging the skin but it seems to me that a lot of women don't know the right way. You take a cotton pad and put some product on it. Then place the pad to the area where you want to remove makeup and hold it there for a couple of seconds. This will help the product to start working. Then wipe with downward strokes. At the end rinse with water. I didn't do the last step. I had a feeling that if I'll leave it on, it will nourish my skin. It is very important to shake well before using it. When I first tried it, I didn't like it because it felt too greasy and didn't work well. So, shake, shake, shake!!! In my opinion, this is nice but I think it is better for dry skin. It works well but for that amount of money I would always rather buy BIODERMA. So, I am not going to buy this one again. Rinse-off foaming cleanser was also nice and gentle. It is unscented but when I opened mine it smelled weird. Like a medicine but then the smell disappeared or I got used to it. 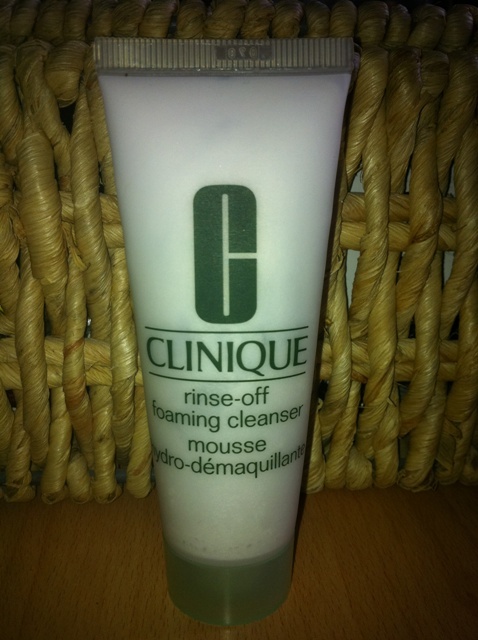 As I said, it does its job but I wouldn't buy it because there are nice, cheaper cleansers on the market for me. If you have dry and sensitive skin, I think you would really like this one. It is targeted for dry combination and combination oily skin. My skin is oily combination, not sensitive but I thought that the time is perfect to test this after a long winter that left my cheeks dry. Won't be repurchasing this one, either. Also a bit expensive for cleanser, 150 ml/5 oz of products cost 15.50 GBP/20 Euros/cheaper on the US market, about 20 $. 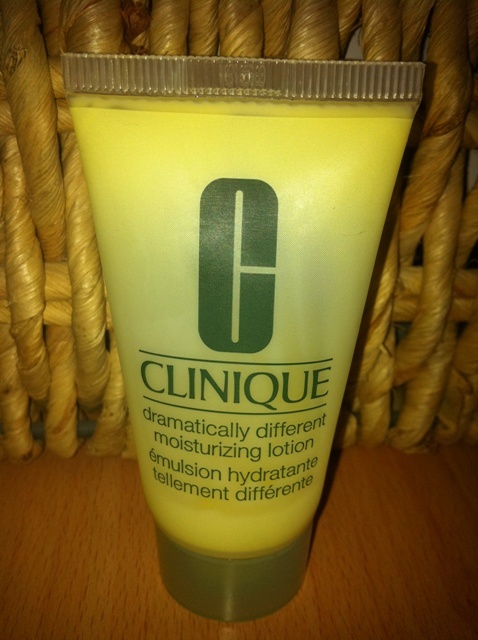 And finally, Dramatically Different Moisturizing Lotion. The one I have is for very dry to dry combination skin. I know, I know, not for me but I wanted to try it on my dry patches. It is OK. Also unscented and gentle but didn't make a huge difference for me. It didn't break me out or clogged my pores but didn't help with the dryness, either. There are different sizes of this product. 125 ml/4.2 oz will cost you 29 GBP if it has a pump and 28 GBP if it only has a cap (about 33 Euros). Also cheaper on the US market where it costs 23.50 $. I will not buy it. That is it. No Clinique for me in the near future. What do you say? Have you tried any of these products? Planning to buy some? Anyone tried DDML for oily skin?